Here is what I made! The lion king is one of my favorite movies so of course I had to do Scar!! The sentiment is from V is for Villains and is stamped on a flag die. 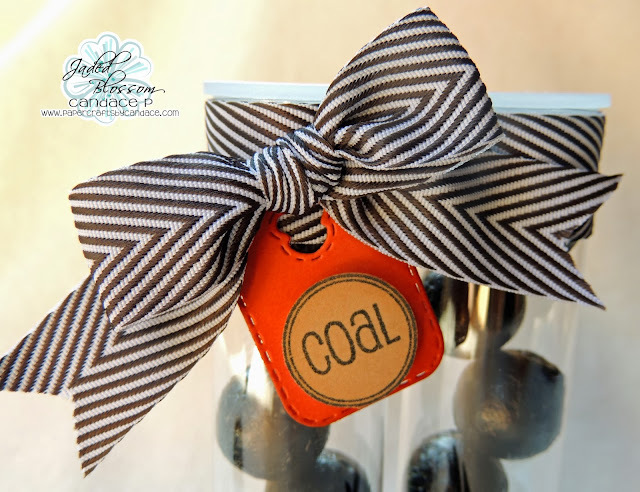 COAL is from Christmas Candies and its pop dotted on a small bread tag from Mini Tag Dies. Next up on the Hop is MICHELLE. 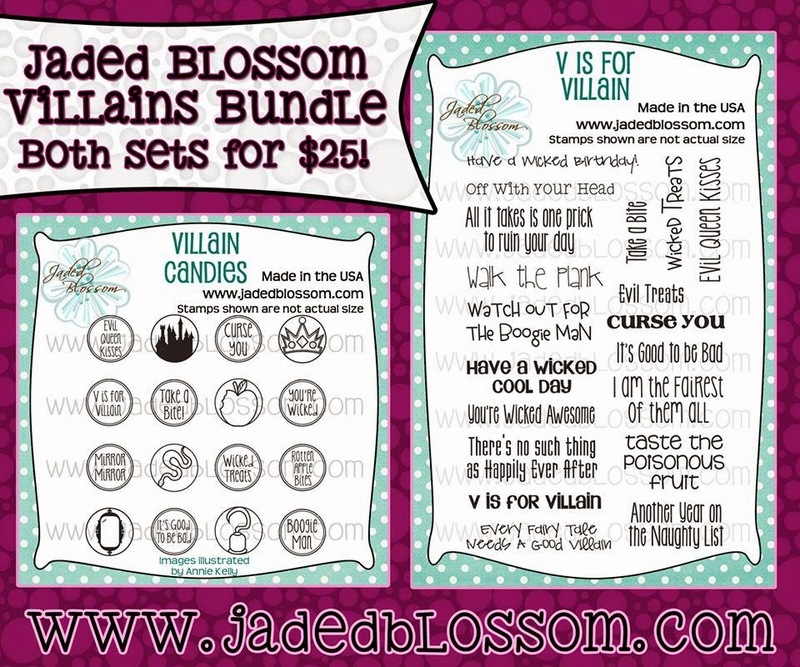 But before you go here are some information on Jaded Blossom. "FREE FILES INFORMATION" The Files for this Villain Hop are available now until 7pm, est on Saturday, November 30, 2013. NO EXCEPTIONS, so please make sure to get your email in on time. Due to the holiday weekend, We will NOT be online to process them as they come in, so please bare with us. Please follow these directions to claim your files. 3 - Use the following LINK (click HERE) to fill out the Official Hop File Request form. Love this new set.already ordered and love love scar and lion king..
Holy Moley baby Scar is adorable! Love the colors! I truly enjoy all of the creative ways you put these files together! Bought the stamp set already in anticipation of this blog hop. I love this guys growly face! So cute. Perfect for the Disney lover in the family. You don't see much with Scar and the colors match so nicely. Scar, I think I watch too much Disney. Looking forward to the blog hop. OMG, he is sooooo stinkin' cute!! LOVE HIM! Hihihi, Scar sure looks like he's so angry about something lol. Ok this is only the first stop on the list and I'm already loving the file! I love your project! Thank you. Scar will go great with boy stuff! love scar. he's so cute!!! The little scar is so cute. Great project. There is no such thing as too much Disney lol. Love this. Awwww he is so cute, but also fierce looking! Amazing job! Lion King is one of my favorites. I just love Scar. Fabulous. /Very nice, I hope I don;t get coal. I love the stamp set and I love what you did with Scar! He's one of my fav. villians! I love The Lion King too! You did an awesome job on Scar! This is great! I love your blog hops and all the work you put into it all. Love the lion king! Great project!! this is great!!!! love the lion king!!! This is the cutest Scar I've ever seen!!!! It is interesting that you can turn a mean old lion into something so cute. love me some scar! too cute! Great project! My grandkids will love this! Great files -- thanks for doing this! Oh my word, too cute!! Love the villain's :) Happy Thanksgiving! Love Scar so mis understood lol. Love love love it!!! Lion king is definitely a favorite at my house. Love the stamp sets - could be used for so many things. So cute - Thanks for the hop!!! I already ordered this set since it is a MUST have!! Great project and thanks for more inspiration!!! I'm really excited for this one! Scar is super cute! Love the cute Scar, it is hard to find a cute villain for 3 boys. So excited for the hop. Love it! This is a super fun stamp set! AHH Scar! He is amazing! I love this sentiment with him! I love this file. Can't wait to use it! One of my favorite all time movies and you captured Scar perfectly!! What an incredible project! I love your little Scar!! so cute! I know the perfect person to use little scar for! Villains! Is good to be bad sometimes. Cute Scar. Cute ideas! thank you for sharing! Super adorable new stamp bundle! Just LOVE the sentiments and your project is AWESOME!!!! Can not wait to see what everyone else created! Thanks for sharing, happy Friday and have a GREAT weekend!! I love this! I can definitely use this for my Disney pics! So cute! I love Scar, and the villains stamp sets are so cool! Cute Villain ..love the scar Scar! Your creation of Scar is just wonderful. Thank you. been waiting for this hop!!!! I am so excited to start this Hop!!! 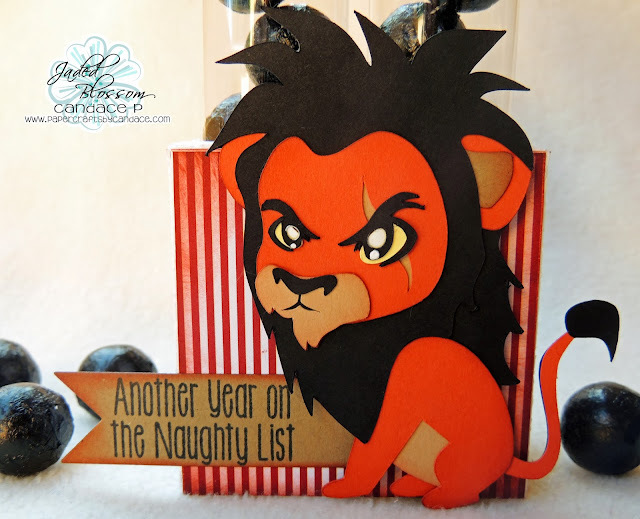 Scar is perfect for the naughty list!!! Awesome candy box! I love Scar too he is one of my favorite Villians! Thank you for the files I am now a follower. Love your project. Scar sure an evil villain but he is so cute. Great project. Need to go shopping again! Oh so cute. I just love the lion king. Scar looks great. So fabulous! Really glad I ordered this set! I love how Scar is pouty! Your bows are always perfect too! I'm going to have to invest in that bow making thing. You did an awesome job. I love him! I love Scar and these evil villains are going to be so great, I just know it. Great Ideas. Im a new follower. Thanks for sharing with us. I'm so excited about the villains!! :) I love your project too!! Scar looks so great with your "coal" candy. Well done! Wow! So much talent--makes me wonder if I can ever catch up. Been out of the crafting world way too long. Wish that I had these stamps 5 years ago when my daughter was small and loved Scar!!! So exciting and loving the villains!! This is such a wonderful set of files, thanks so much. Thank you for a chance to get these files. love your work. I Love Jaded Blossom. I'm just getting started and am very excited. The Lion King is one of my faves too! He is so cute and too cute to be a villian! lol I am a follower and have subscribed to your newsletter. What a fun blog hop & cute project!!! 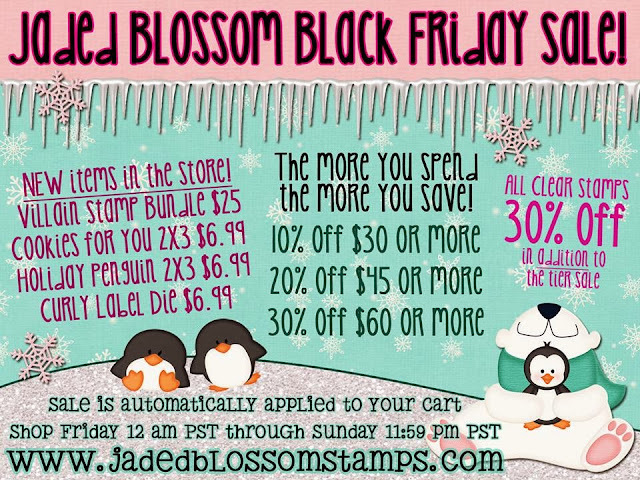 :) Can't wait to hit the stamp sale over at Jaded Blossom...and have to buy my files at SVG Cutting Files, too!!!!! Scar is great, thank you for sharing! Thanks for this hop! Looks like super cute stuff!! love the theme of this hop! OVE LOVE LOVE LOVE it! Love your project! Scar looks amazing! Thank You so much, I love it. <3 the take on the Villains side in these projects! Great blog hop! Thank you for the cute project! I did not see my comment, but I just wanted to say that your project is very cute, thanks a lot! Wow - I love your lion and it's a dynamite project - TFS! A very cute villain! I love how you combined it with the new stamps! New follower, can't wait to see more! LOVE THIS!!! and the release is phenomenal! Cute project, and I love the sentiment! Thanks for sharing!!! love these and so does my 4 year old! awesome!! My niece was standing here when I came to the site and shouted SCAR!! when she saw him... very cute. This is ABSOLUTLY wicked Candace!!! That is so neat, Love the Coal idea. OMG! Love! 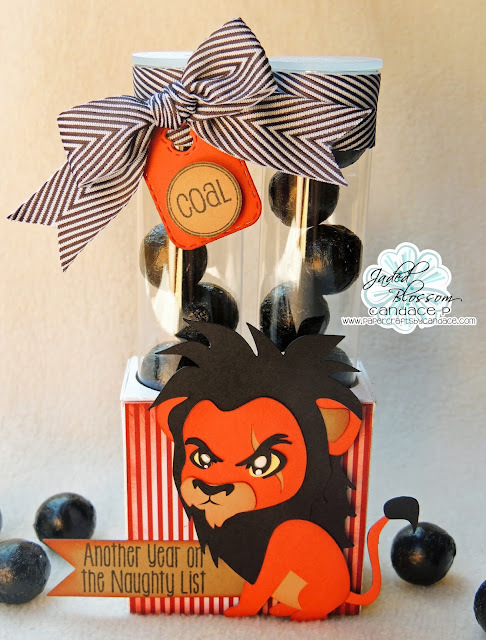 Love the candy that looks like coal as well! Great work! The Lion King is one of my favorite movies ever! Thanks for the inspiration. Gotta love those "bad guys"
Love reading you blog! Such cute ideas all the time! Thanks. Your caption is perfect for Scar! Great job. Super cute project ! I love the sentiment ! You made Scar cute!!! Love the sentiments ... evil queen kisses a favorite! I love the lion king!! So cute!! Great lion. My son loved this movie and lions. I'm so excited to see the projects on this hop. I love Scar! Too cute! Scar is adorable. 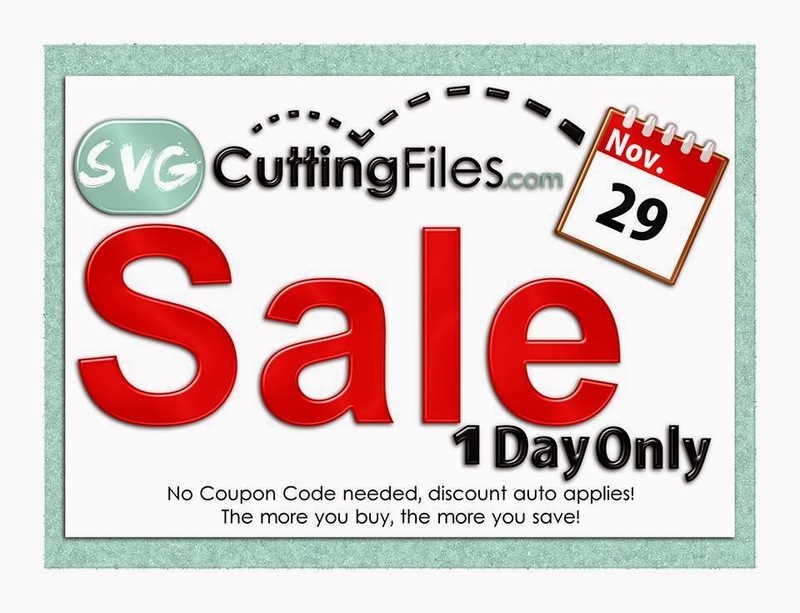 I am a frequent shopper at both JB and SVG Cutting Files. Also a follower of your blog. Thanks for this Hop. Love it Thanks for sharing! Scar is one of my favorites! I absolutely love him. Each hop brings even cuter files and stamps. You gals are amazing. Scar is the best! Cute file! I really like Scar too! Adorable!! !